RIO DE JANEIRO – On August 9 and 10, CHC Brasil held its fourth CHC Safety & Quality Summit in Rio de Janeiro. This year's event was attended by more than 150 attendees and featured nine presentations around the theme: "Consistent Level of Safety: Continuous Monitoring of Systems and Human Performance." The event began with opening remarks from CHC's Vice President of Safety and Quality, Duncan Trapp, followed by Marcelo Soares, CHC’s regional director of Latin America, who emphasized the importance of safety for the company. He also recognized the team of local employees who worked hard to host the event, including Ana Claudia Malagrino Galvao, Regional Manager of Safety and Quality for Latin America. Karl Fessenden, President and CEO of CHC Helicopter, reaffirmed the need for safety not only for the company but for aviation in general, "One of the greatest benefits of participating in such an important exercise is the opportunity to collaborate and learn from each other. Many times our own internal business priorities prevent us from working together on a regular basis, which makes events such as this one such an excellent forum for collaboration. Among the speakers, Scott Shappell, professor and chair of the Human Factors and Systems department at Embry-Riddle Aeronautical University, spoke about human factor errors and how to optimize work. Through examples carried out in common routines, he demonstrated the importance of attention to the small details and how they can make a difference in daily operations. 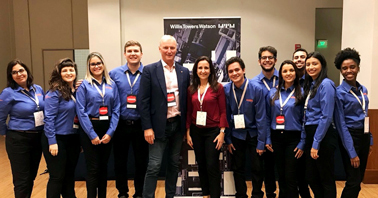 After holding a successful event, the team in Brazil is already planning the fifth regional conference for 2019. CHC is also preparing to host its 14th annual global Safety and Quality Summit October 2-4 in Dallas, Texas and will host hundreds of delegates from around the world. CHC Brazil is a subsidiary of CHC Helicopter. For more than 70 years, CHC Helicopter has provided safe, reliable, cost-effective helicopter service in some of the most remote and challenging environments around the world. With extensive experience transporting customers in the oil and gas industry, supporting search-and-rescue and EMS contracts, and providing maintenance, repair and overhaul services, our dedication to safety and reputation for quality and innovation help our customers reach beyond what they thought possible. Visit www.chcheli.com for information. This press release and other statements that we may make contain forward-looking statements. Forward-looking statements are statements that are not historical facts and include statements about our future financial condition and future business plans and expectations. Such forward-looking statements are based upon the current beliefs and expectations of our management, but are subject to risks and uncertainties, which could cause actual results and/or the timing of events to differ materially from those set forth in the forward-looking statements. The forward-looking statements speak only as of the date on which they are made and we undertake no obligation to publicly update such forward-looking statements to reflect subsequent events or circumstances. Should one or more of these risks or uncertainties materialize, or should underlying assumptions prove incorrect, actual outcomes may vary materially from those indicated.